R.D. 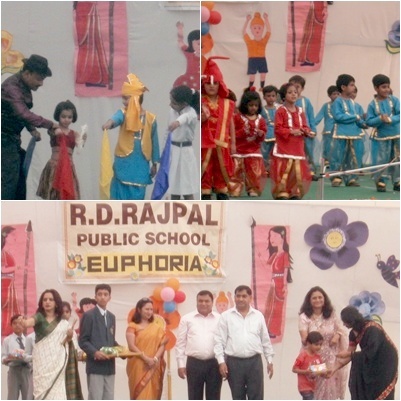 Rajpal Public School as an educational institution believes in creating all-rounders from an early age. To propagate it, many events, workshops, programmes as well as festivals are organized to improve and encourage the students to explore and excel beyond academics. The school has committed itself to help the children grow physically, mentally, emotionally and psychologically. Co-curricular activities are important as they give the ability to enhance their speaking skills and help the kids to develop team spirit and confidence. A step was initiated by the school to capture the essence of each child’s ever growing imagination, creativity and literary abilities in the form of a mega event “Euphoria-The Talent Quest” in the school premises on 13th and 14th November for all the children from age group till 10 years. The aim behind the event was to hone the inherent skills of the students in multi varied fields and providing them a platform to exhibit their talents through a plethora of activities. To explore vistas of creativity and talent the young children were invited from all over Delhi to showcase their skills in various fields. There was registration for different competitions like solo dance, fancy dress, coloring competition, best out of waste, diya decoaration, fun races to name a few. The whole school was echoing with enthusiasm and excitement among the children as well as their parents. The ceremonial lamp was lighted by the chairman Mr. Ishwar Rajpal, Secretary Mr. Subhash Rajpal and the Principal Ms. Alka Kshatriya to inaugurate the event. There was a cultural programme by the school students which included Goan dance, Rajasthani dance, Punjabi Bhangra to depict the cultural heritage of our country. Yoga and skating performances enthralled the audience. The school choir and orchestra group presented their musical expertise in symphony. There was a skit performance by the children based on the theme “Importance of Education” which was an attempt to kindle the spark of learning in every mind. The students enacted beautifully and showed the importance of education in the life of human being. The magic show and puppet show brought life and laughter around the stage. The main attraction of the day was the Baby Show which attracted a large crowd. The parents with their children falling between the age-group 0-3 years thronged in their respective venues to showcase the special features of their tiny tots. The team of professional doctors and pediatricians from esteemed hospitals were there to inspect and put the children into specialized categories. The judges, eminent personalities, appreciated the artistic, rhythmic and oratory skill of the students at such a young age. There were games for parents and grand parents which rejuvenated the entire crowd. Everyone came all geared up to show their best performances. To cater to the participants in a large number there were five or six venues for a single competition and best three were selected from each venue. This gave a fairly good chance to win so many prizes to all the deserving students. The day concluded with the prize distribution ceremony where prizes and the momentos were given away to the winners. The children were too happy when their name was announced and they were running with thrill and feeling of satisfaction onto the stage to receive their prizes. The Principal motivated and appreciated the efforts of all the students, teachers and parents to mould the young minds towards the path of success and progress.